For our third anniversary my husband surprised me with dinner at a restaurant that I had been excited to try for quite a while. 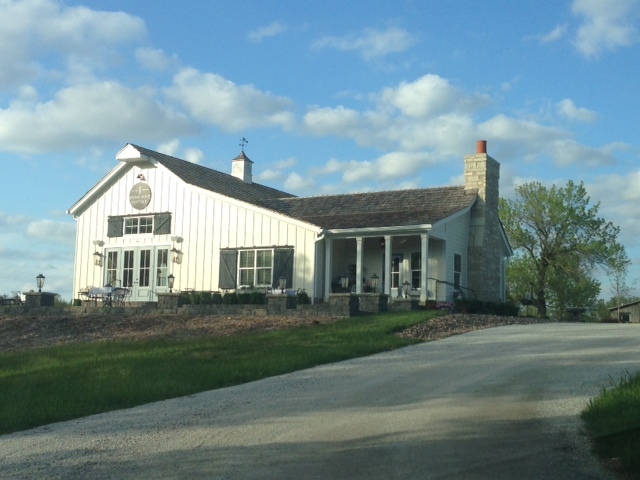 Stone Soup Cottage is a family operated restaurant serving gourmet, farm-to-table food in Cottleville, MO. This upscale but modest restaurant is inconspicuously located down a gravel road in a cottage that could be mistaken for your grandparent’s house. Farmland surrounding the restaurant provides much of the food served in the restaurant. Beautiful flowers line the sidewalk from the gravel parking lot up to the front door of cottage and the warmth of a fire place greets you once inside. Seating is by reservation only and this must be done weeks, if not months in advance. All guests are asked to arrive for dinner at the same time to accommodate for their pre-fixe style of food. Once we arrived at 6:30 p.m., we were taken down a short hallway, past a window giving us a view into the kitchen, and into a beautiful dining room. The tables are so spread out and the room is so nicely done that you almost feel like you are eating in your own house. 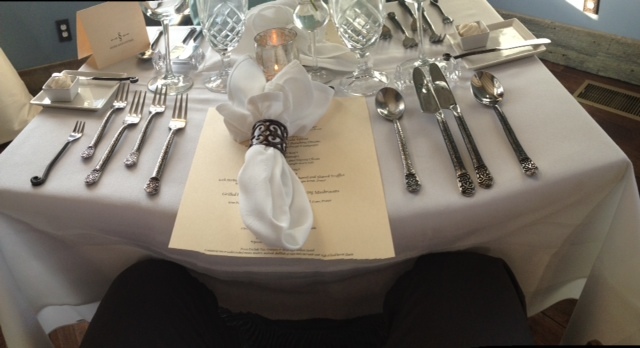 We were seated at a table for two with no less than 11 pieces of silverware at each place setting. We ordered drinks and then ventured outside to look at the grounds and enjoy the nice weather out on the patio. At 7p.m., all of the guests were called inside to begin the six course meal. You are given the option to do wine-parings with each course but we opted for individual drinks. 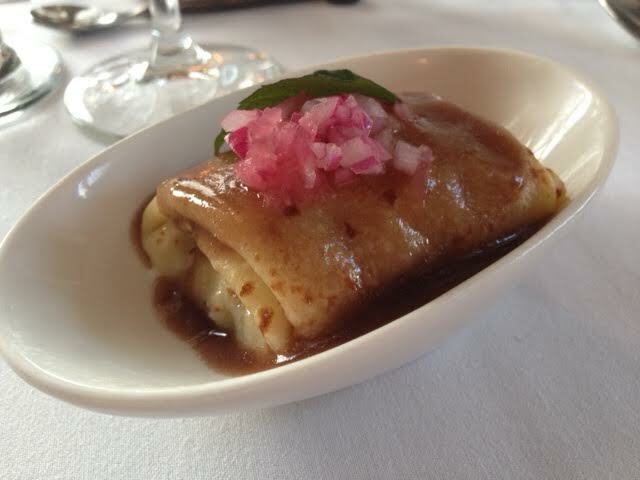 The same course is delivered to each table at roughly the same time, sometimes by the chef himself. Although the menu is set ahead of time, my husband notified the restaurant that I am a vegetarian when we made our reservation and the chef was more than accommodating. The menu is seasonal, so make sure to check the Stone Soup Cottage website when you make your reservation. The first course was lobster consommé followed by an arugula salad. The next course was calamari stuffed with leeks, garlic, and nicoise olives. The fourth course was an asparagus tart. Fifth was grilled duck breast (sea bass for me) accompanied by corn pudding. Last but not least was a hot rhubarb soufflé with white chocolate sauce. Each course was more delicious than the last, but I have to say that nothing beats a perfectly done soufflé. Although the food was great, my one complaint would have to be about the service. It felt like the staff was so busy trying to get food out to the tables, they had little time for anything else such as offering a second round of drinks after they cleared the first glasses. This unique meal does come at a price. Each guest is charged $90 for their meal, not including wine parings. Our original reservation was cancelled by the restaurant due to a private event but they were nice enough to provide us with a large gift certificate as an apology. Although my wallet will sadly prevent me from coming back soon, I’m so glad I got to experience this amazing restaurant.